Most Damascus steel rings are built with longevity in mind but some are susceptible to rust. 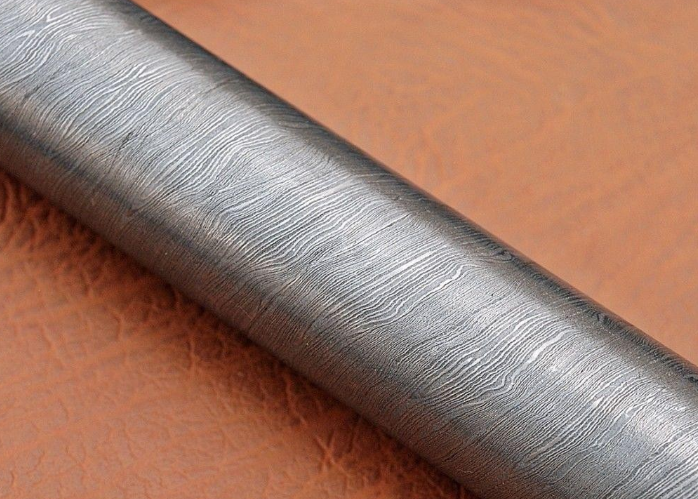 There's a huge variety of steel that can be used to craft the Damascus ring. The last thing you want to have on your wedding day is a finger lined with brown rust or tarnished steel. 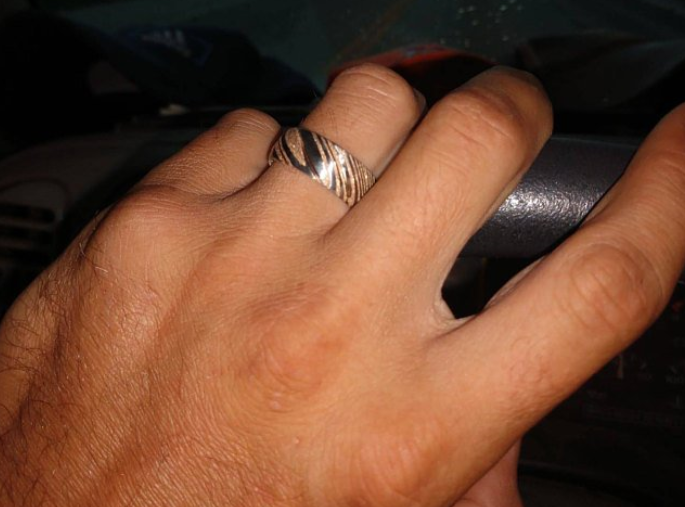 Damascus steel creates a bold and powerful ring. It's a high quality option to break from the mundane wedding rings of the past. 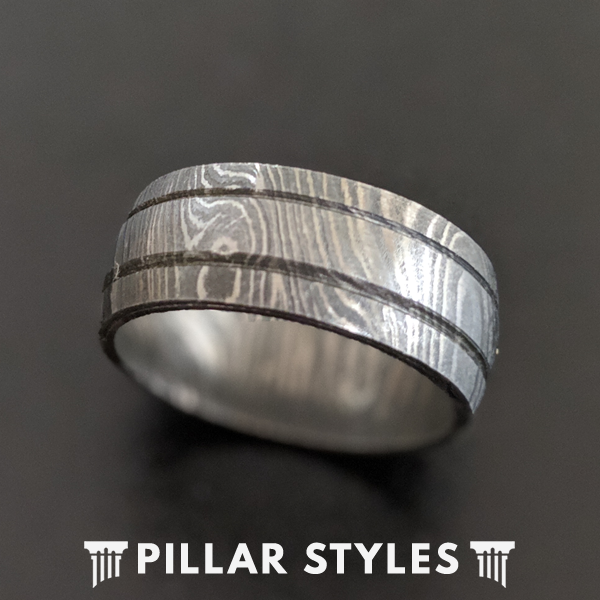 However, not all Damascus steel is created equal and knowing the differences can make or break your experience with this unique folded metal ring. Will Damascus Steel Rings Rust? Good quality steel alloys will hold up even in the most rigorous conditions. It won't rust and is resistant to corrosion and scratching. When shopping for your Damascus ring, be sure to distinguish that the ring is comprised of stainless steel. 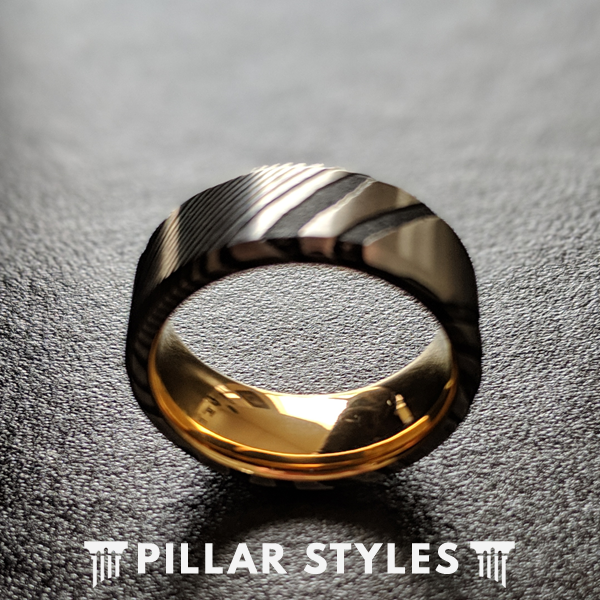 While the embedded ripple and swirl patterns make Damascus rings easy to spot - the type of metal used in the ring is something you might not spot with the naked eye. The most reliable type of steel that is used in a Damascus ring is typically labeled with 304 and 316 stainless steels. It prevents any type of liquid from permeating into the band to keep it looking great. The good news with Damascus rings is that the care for keeping it look great is next to nothing! By simply wearing your ring, the oils from your skin will "mold" with the ring and add an extra natural layer of protection. If you like to spend a day at the beach, tending to your garden, or working in the garage, the Damascus steel may naturally accrue some dirt and grime. A mild soap and warm water is all you need to clean the ring. A new toothbrush will help get into the cracks and folds within the steel to bring it back to pristine condition. If you don't plan on wearing your ring long term, the best way to protect the ring is in the ring box in a low humidity environment. It's that simple! Think of Damascus steel like a paintbrush. It can be used for broad strokes and bright colors, or intricate portraits with a look of simple sophistication. Damascus rings can be crafted with swirl or wood grain patterns or paired with a gold inlay on the wedding band. 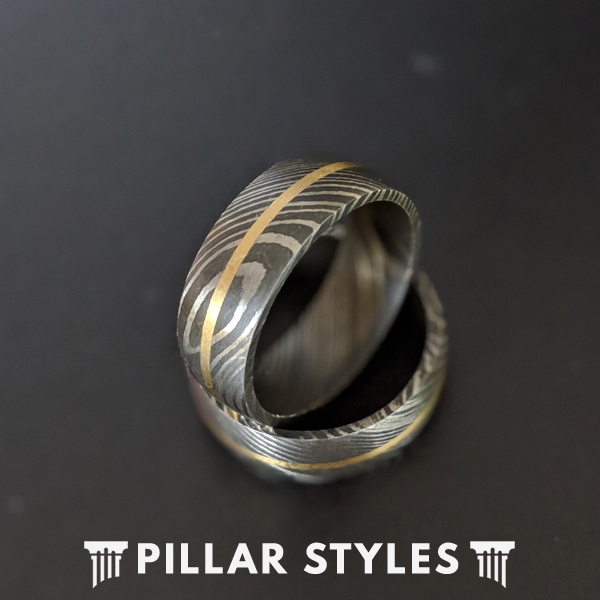 In addition, Pillar Styles uses alternative materials like carbon fiber and reclaimed wood to create a one of kind wedding band. Your ring is like your fingerprint - it's exclusive to you. Below are some examples of what type of rings are available. 14K Gold Damascus Steel Ring with a swirl finish and 8mm width. 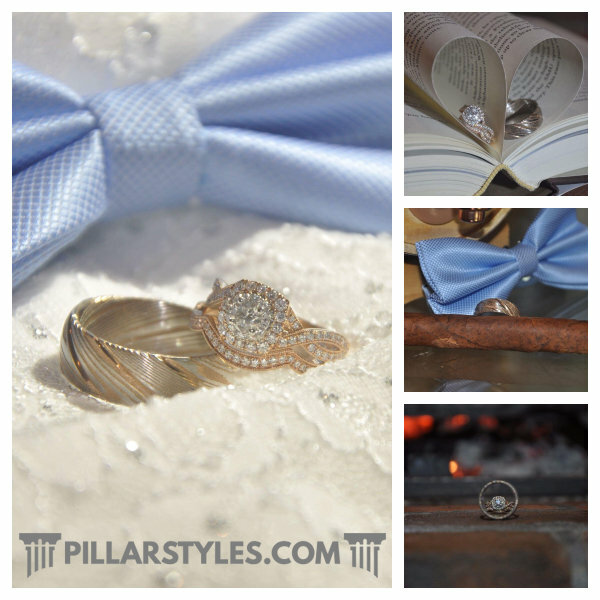 Your ring with Pillar Styles is guaranteed for life! We stand behind each and every unique ring that is crafted with precision and passion. Should an issue arise with your wedding band, it will be repaired or replaced for you. This covers almost everything except the Damascus ring being lost of stolen. Shop with confidence. We have thousands of customers and raving reviews. 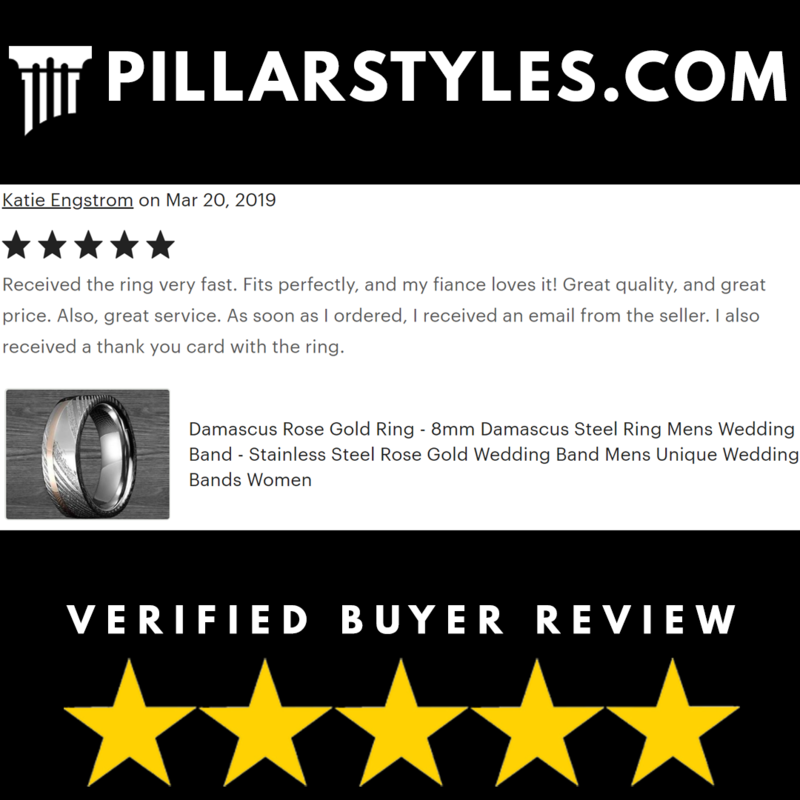 Here's what others are saying about our Damascus wedding bands. Tap the image to get more information on the ring. "Above and beyond! I will recommend this seller to everyone. It was truly a pleasure doing business with you!" "Received the ring very fast. Fits perfectly, and my fiance loves it! Great quality and great price!" We're always adding new designs of innovative, unique Damascus steel rings. If you're looking for a unique ring for your wedding, celebrate an anniversary, or gift to someone special - view the entire collection here. If you have a custom Damascus ring design idea, reach out to us to make it a reality! 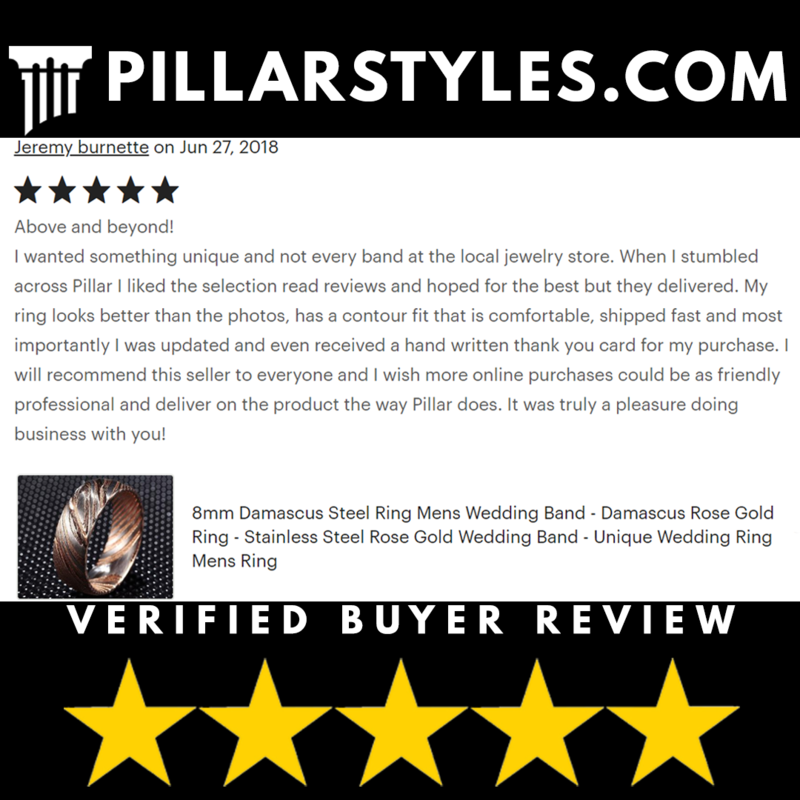 We happily accept custom orders and look forward to making your dream wedding band.